Sharp - MXSCX1 5000 STAPLE CARTRIDGE "3 PACK"
In today's fast-paced business environment, you need to operate at peak efficiency. 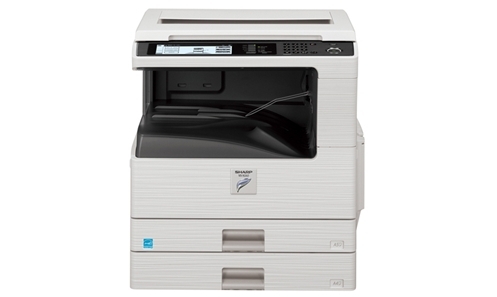 And with Sharp's MX-M260 Document System, you'll be able to raise office productivity to a whole new level. With enhanced versatility, the MX-M260 Document System delivers everything your business needs to get ahead by offering 26-ppm copying and printing, convenient networking, and integrated multifunction capabilities. This Document System is ideal for busy departments and workgroups. Available features include a 100-sheet reversing document feeder, auto duplexing, 1200 x 600 dpi (enhanced) laser output, and a large 8.1" (measured diagonally) touch-screen LCD display that makes operation easy and intuitive. Advanced micro-fine toner technology offers sharp, high-quality images page after page. And best of all, the modular design makes it easy to add functionality to adapt to your changing business needs. Optional multifunction capabilities include PCL® 6 and Postscript® 3™ compatible network printing, network scanning and Super G3 faxing. Embedded software delivers easy-to-use web-based management tools as well as state-of-the-art security features that help your business protect intellectual property and meet regulatory compliance. Auditing and job retention features allow print tracking for greater cost accounting. Scan destinations can be selected manually through QWERTY keyboard on touch-screen, or even more efficiently via up to 200 one-touch destinations, which can be entered and stored. @ for Point & Shoot Cameras, SLR Cameras & Lenses, Digital Cameras & Memory, Film Scanners, DVD Players, Camcorders, Inkjet Printers, Laser Printers, Plasma TVs, Multimedia Projectors, Desktop Video, Notebooks, PDAs, Fax Machines & Supplies.